The other day hunting with Jake, it got me to thinking about the first time that I shot a goose. I was 12 years old. 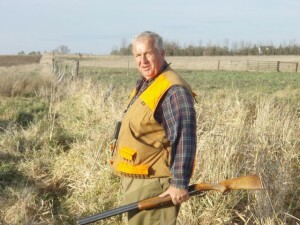 I had been hunting geese for a couple of years at the time and we would only average about 3 to 6 geese a year. The club that my dad was a member of had leases up around the Windsor reservoir. We never hunted over decoys because we were in these box blinds that were spaced about 150yds apart and there were usually 15 to 20 in a field. The hunting wasn’t that great. Most of the shots that we had were passing shots and most of those were usually way out of range. Sky-busting is what we called it. 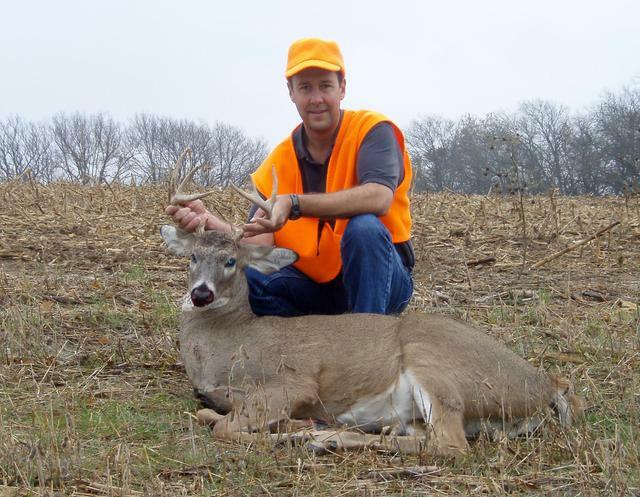 We used 00 and 4 buckshot to hunt with. That morning was typical of most other mornings. It was cold and the geese were slow in coming off of the lake. We had one flock come over that we shot at and I can remember that the floor in our blind had a covering of snow over it that had turned into ice. As I would shoot that old 870 straight up, granted I barely had arms long enough to work the pump, the recoil after each shot would slide me across the floor until I was backed into the corner. About mid-morning another flock came over us and finally I was able to connect on a goose that was towards the back of the pack. I have killed a lot of geese since then and hunted them a lot of different ways but after almost 26 years, I can remember it like it was yesterday. I have been fortunate to harvest many animals in my brief hunting career, but the ones that stand out the most for me are always my firsts. As I reflect back on the hunting that I have done, I look at all of the memories that I have made for myself and I can only hope that my kids will be able to build there own memories and adventures. To my friend Jake and to my future best hunting buddies Jacob and Caleb. (I know that you are too young yet!) Remember your firsts, because that is where it all begins. Oh! One more thing. To my good friend Jim: “How about them Tigers!” You owe me a soda pop! It’s the first time I beat him in a bet if you are all wondering. Can you remember where or what you were doing the last day of 2007? I can tell you exactly where I was! Sitting in a wind swept, snow covered corn field southwest of Greeley, Colorado, trying to keep my nose from freezing in the sub zero wind chilled air hunting geese. Sounds fun? Well, I will tell you that I would not have missed it for the world. 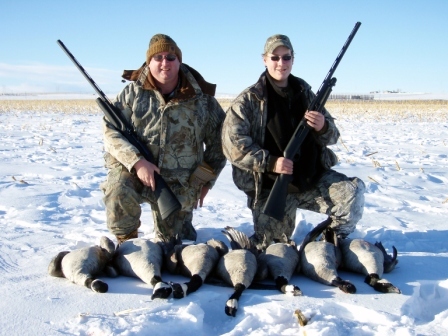 I took a good friend of mine, Jim and his son Jake, out that day to try and get in one last day of goose hunting before our licenses expired for 2007. This was the third time that I had taken them out this past year. The first time was at the beginning of 2007 and the second time was the day after Christmas. Both times we had come up empty handed. The first time we ended up getting my truck stuck and spent most of the morning getting it out and the last time we sat there in pea soup thick fog until we finally called it a day. To say that they were getting good at putting out and picking up decoys was an understatement. This time I was keeping my fingers crossed that Jake would be able to knock down his first goose. Hopefully we all would at least get some shots! All morning long we watched as geese flew around us from field to field, but by noon, we had not had any come in on our set. Jim and Jake had planned on hunting only the morning. As they were getting ready to leave, Jim offered to buy me lunch. Being the starving type of hunter that I am, I graciously took him up on it. About half way to the trucks, geese started coming in on our decoys out of nowhere. I suggested that we go ahead and head to lunch. I figured that the way the geese were starting to fly, the afternoon hunt would be good and I sure hate hunting on an empty stomach! After lunch we headed back out to the field. When we got there we noticed that we had 20 to 30 extra decoys! Of course these guys were a little bit more apprehensive than there molded plastic playmates, especially when three large camouflaged men started coming at them with shotguns. Trying to put the sneak on a flock of geese in an open field is about like trying to win the lottery, TWICE! It just doesn’t happen (at least not very often). Once we had done a good job of scaring off the geese that were in the decoys, we disappointedly hopped back in the pit and got ready. We didn’t have to wait very long before the previous hunts started to pay off. The first flock came in and we knocked down a bird. Then gradually the chaos began. We started having flock after flock come in, almost so fast that you didn’t have a chance to completely load your shotgun. Then it happened. We were coming out of the pit to shoot at a group behind us when Jake and his dad spotted two that had landed in the decoys on there end of the pit. They quickly swung on the geese as they took off and Jim and Jake both connected! We had several other opportunities to shoot at birds that afternoon, but like all good things the day was getting late and we needed to pick up and get home. Here is a picture of Jim and his son Jake with the geese that they shot. Congratulations Jake on a job well done. See you in the pit! Last Sunday I was finally able to get out and do a little goose hunting! I picked my friend Darrin up around 5:30 in the morning and we headed out to the field to meet Roy, our other hunting companion. When we arrived it was a balmy 9 degrees out. Roy had called and said that he was running a little late, so not wanting to spend too much time in the heat wave that we were experiencing; we decided to wait in the truck until Roy showed up. The anticipation finally got to me and Darrin and I started setting up our decoys a few minutes before Roy showed up. Darrin being the good friend that he is located our pit in the dark, by almost falling into it. 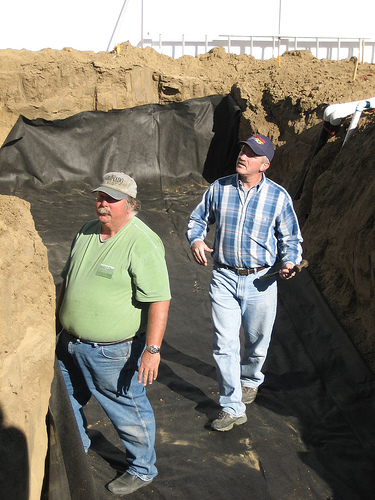 For those that have never hunted out of a ground pit, it is basically a hole that is dug in the ground, and then it is covered with a top of some sort. In this case it was several pieces of plywood that have holes cut in it so that a person can fit down inside the pit and hide. still of the morning you could hear the sound of the geese on a nearby lake. My hopes were high that it would be a good morning filled with a lot of birds committing Hari-Kari. Sun-up came around 7:15 and we were ready! All of us were scanning the sky waiting for the first flock to come in. 8:00, 9:00, and then finally at 10:20 we started seeing our first flocks of geese. The only problem was that they were getting up off the lake and going about a half a mile east of our position to a very safe golf course. So, to say that that pretty much put the nail in coffin for this hunt was an understatement. If you have ever hunted geese, you know that no matter how many decoys you have out, you will never be able to compete with the real thing! The geese were definitely smarter than us on this day. However it wasn’t a complete loss. I was able to hunt with two friends that I don’t get to see or spend much time with and we were able to catch up on what was going on in our own lives. Overall it was a great day. Stormy, my significant other, thinks we are out of our gourds for sitting in a frozen field for hours, but for those who have experienced the excitement of geese coming into a spread of decoys, with their wings cupped, totally committed and ready to land on your head! You know what I am talking about! 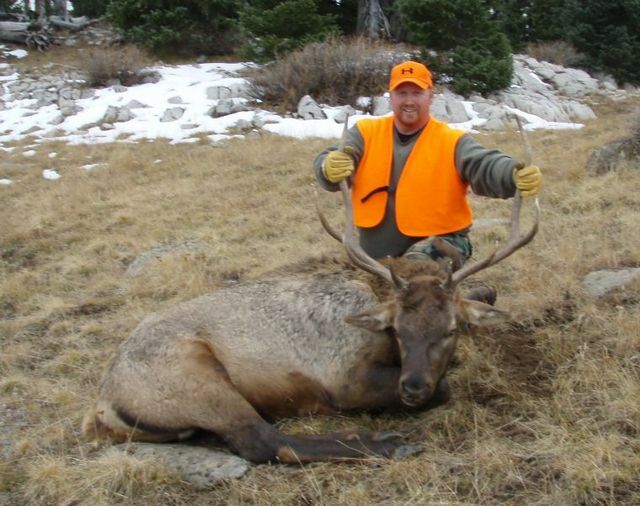 Well it looks like the National Park Service has determined to cull the elk herd in Rocky Mountain National Park. The only problem is that is going to cost almost six million dollars to do it! 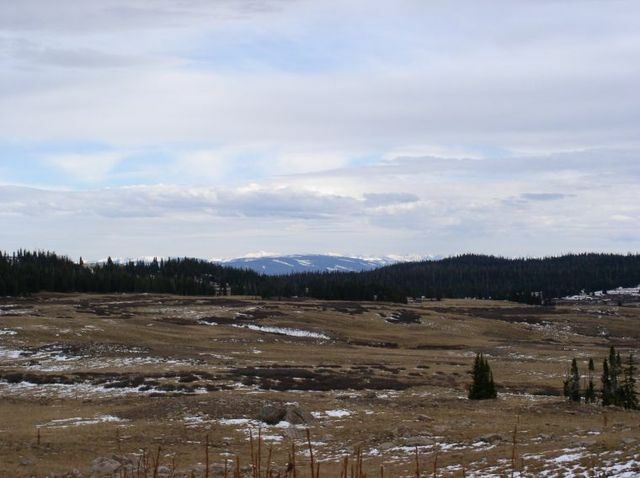 Instead of allowing hunters to purchase licenses and make money for the National Park system, they are going to use their seemingly inexhaustible amount of revenue to pay for it. So the next time you hear about the National Parks having trouble coming up with funds to maintain their operations, just remember that when they had the option to make money or spend money, they decided to spend it! It is just another example of how being “Politically Correct” has cost them more money. 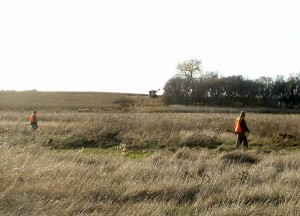 Two weeks ago I found myself out in the thriving metropolis of Western, Nebraska (population 200) for an early November white-tailed deer hunt. 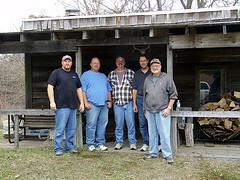 I was going to be hunting with a few of my good friends John R., Jay R., and Myron on John and Jay’s family farm. 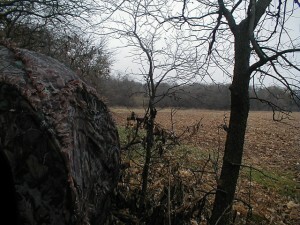 This was the forth time that I had been hunting out here and in the past I had always had a good time and a good hunt. A number of years back, with the help of some of friends, John built a cabin smack dad center of their property. When I say cabin, I don’t really mean a huge lodge, but more of a supped up Tough-Shed. It isn’t very fancy, but it is comfortable, roomy, and most important, it keeps the weather off of you. Myron and I arrived late Friday night and basically had just enough time to greet everyone then it was off to bed. First light was going to come early and we sure didn’t want to miss opening morning. I woke up at 5:30 the next morning and got dressed, got the coffee going, and rousted everyone else up out of bed. We discussed the mornings hunt and headed off in our different directions. 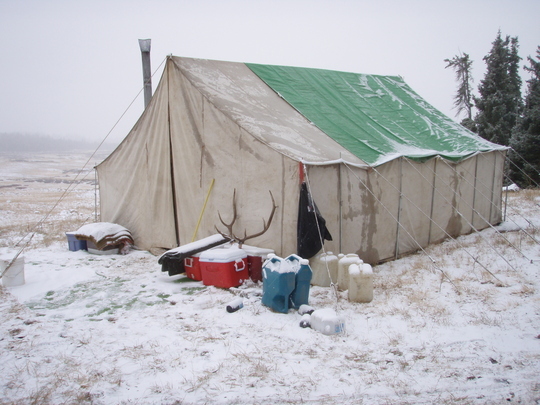 I had been to the property a couple of weeks before on my way back from my pheasant hunt in South Dakota and had placed a little pop-up blind along a fence line overlooking a bedding area. 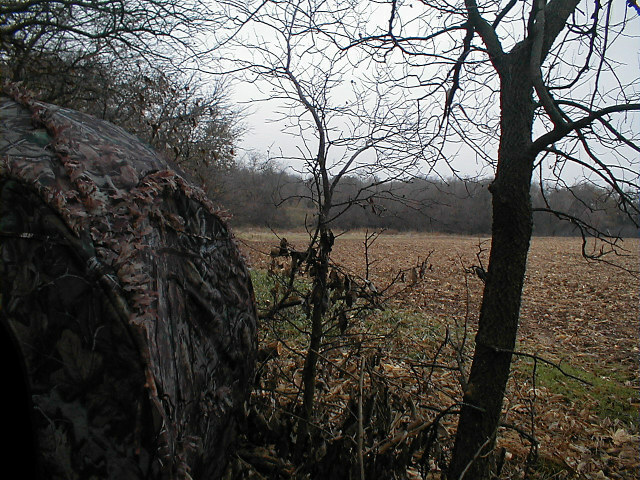 On the way to the blind, I bumped a couple of does that were feeding out in the cut corn field that I would be overlooking as well. Around legal shooting light I noticed some movement down the fence line from me and it happened to be a little fork horned buck. Like antelope hunting, I really get a kick out of white-tail hunting out here. You are able to see a lot of animals and how they react with little to no pressure. It was going to be a short hunt for me so, I really couldn’t be too picky, but I passed on the little buck. I watched him for a while and then about ten minutes later some more deer came out feeding in front of me. I spotted them through the trees and noticed that one of them had a pretty good body on him. When he popped out I noticed that he was a seven point. He looked to be a pretty mature deer, so I decided to take him. I brought my 25-06 up and placed the crosshairs on him and got settled on his chest area and squeezed off the shot. At the shot I heard the distinctive “Q-whack” of the bullet hitting its target. The deer spun around and headed back for the trees. About 10 feet into the trees I found him crumpled up underneath a Bodark tree. With a short drag, I had him up to the road and in the next hour I had him back at camp dressed out and hanging in a tree. By that time Jay, who has become our official camp cook, had a great breakfast whipped up for us. After a hot meal and a few cups of coffee the fellas took off to try and fill their tags. About 45 minutes later we heard a shot back at camp. A few minutes later Scotty had come back with news of success. I went back with him and helped him drag his deer back to the cabin. It was a difficult drag, almost 50 yards and it was downhill to boot! After the mornings hunt, we all set about doing some serious work! Earlier in the year a large dead cottonwood limb had fallen through the most important building on the property, the out-house! 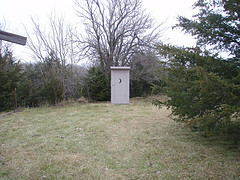 We had found out about it before we had headed out to Nebraska and had built a new one. A true palace all the way down to the moon in the door. Now if you happened to be driving East on I-80 around the 9th of November, you are not crazy -that really was an outhouse on a trailer! Anyway, after a hole was dug and a little muscling around, we had it in place. The next morning we woke up to a bit of fog. 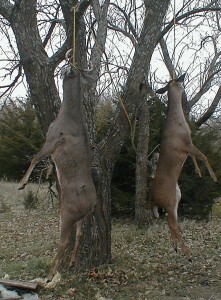 We still had 2 tags that needed to be filled and those guys headed out to were they were going to hunt for the morning. About an hour and a half later Jay came strolling back into camp with a big grin on his face. He had connected on a nice 10 point. We jumped in the truck and went to collect the deer. After a few pictures. We loaded the animal up and took him back to camp. 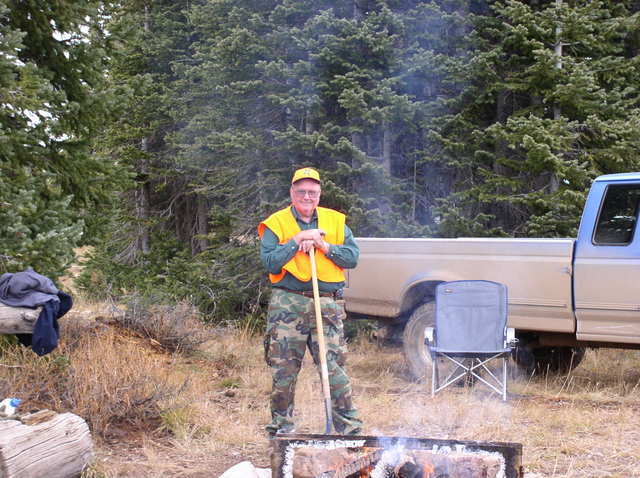 Myron was already back in camp with no luck. So being as how we needed to get back we packed up our stuff and got ready to get on the road. With a last minute photo of the hunters and the cabin we headed out. Once again I would like to thank our great hosts Johnny and Jay. Can’t wait until next year! Believe it or not, I really do have a real job that doesn’t have anything to do with hunting. So in between hunting trips, I really do have to work. This past weekend a co-worker of mine was asking for volunteers to help him put in his new Koi pond at the new house that he just had built. Unfortunately I didn’t have a trip planned so being the good co-worker that I am, I volunteered. Now living here in Colorado, when I think of a pond in the back yard, I am thinking maybe an 8’x8’ or maybe even a 12’x12. So when I noticed all the people that were invited to attend on the email, I figured that we would have this thing knocked out and sipping some suds in about half an hour. Boy O’ Boy was I wrong! When we showed up and walked into the backyard I almost fell over. The hole was dug, which was a good thing, because the pond was about 40’x50’ and 5’ deep in size! Holy cow! It wasn’t a pond but a reservoir! I had never imagined that it would be that big. The email had said that he needed help moving a 600 pound Koi pond. What I didn’t realize was that was just the weight of the Koi ponds rubber liner. However, John had a good plan and quickly put everyone to work before they could turn around a run off! 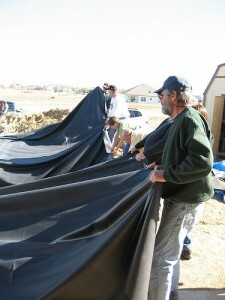 In no time at all with proper supervision from the program manager (John’s wife Tammy), we had the landscape fabric down and were ready for the liner. Fortunately for us the liner came rolled up on a roll that was about 6’ long. 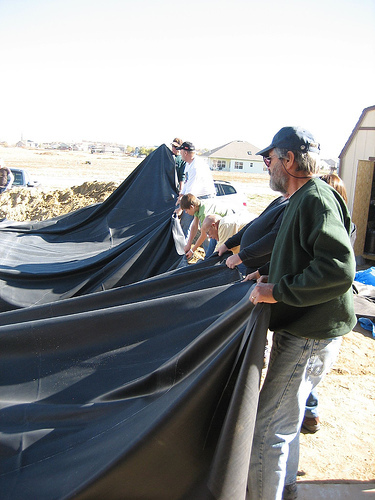 After a little debate we shoved a piece of PVC through the center, picked it up and people started to pull it towards the hole. Once unrolled it was determined that we had the short side going the wrong direction. 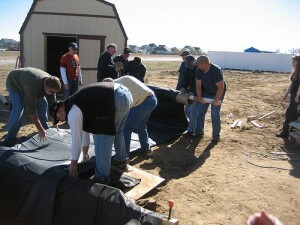 So, with a little muscle we were able to get it orientated in the right direction and started unfolding it. 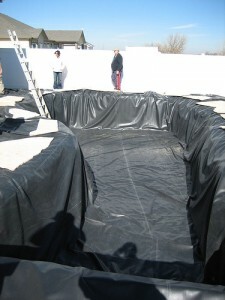 At last it was in position and with a little push and pull here and there we had the liner in place. The last that I heard was that it was about 6 inches from being full, can’t wait until next summer. It is always nice to have a new place to fish! Well I wish that I could lie and say that the pheasant hunting in South Dakota was terrible this year and that everybody should just stay at home. However, that would be a huge lie! 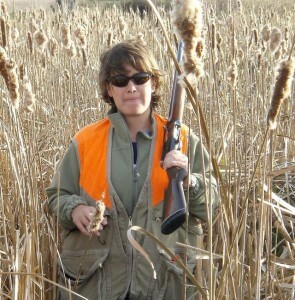 Once again the pheasants were plentiful and offered an enjoyable hunt. 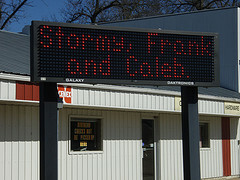 We arrived in Elkton, SD early in the morning and were greeted to a billboard surprise. This is my 5th year of hunting in South Dakota and as in years past I was not disappointed. Our hunting started out slowly. The area that we hunt was hit with over 6” of rain since the first of October, making it nearly impossible for the farmers to get there crops out. When we arrived, they had just started to cut the corn, but with a bunch still standing and it only being Stormy, myself, and our dog Chase the hunting was difficult. We were forced to walk mostly weed patches because the corn was so vast that we just couldn’t cover it ourselves, but the birds were sticking to the standing corn. By the third day of hunting a few more of the crops were out of the fields. We headed north to Lake Norden to hook up with Stomy’s Uncle Larry and his brothers. Here is a picture of Larry and his brother Darwin walking some CRP. In the background you can see the combine getting after it. By the end of our fifth afternoon of hunting we could already see the progress the harvesters were making. The grain bins at the COOP were already filled to capacity and they had already started storing the dry corn anywhere they could. Even right across the street from the diner! Overall it was a successful hunt. 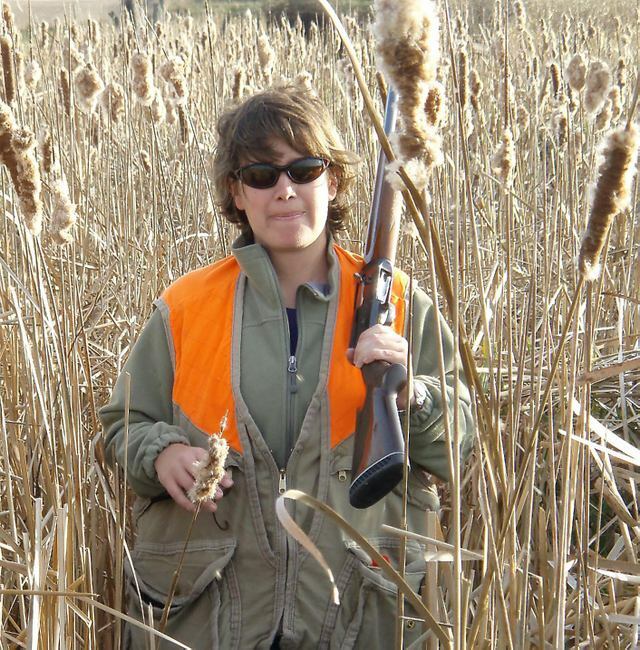 The more corn comes out of the fields in the next few weeks the better the hunting will be. 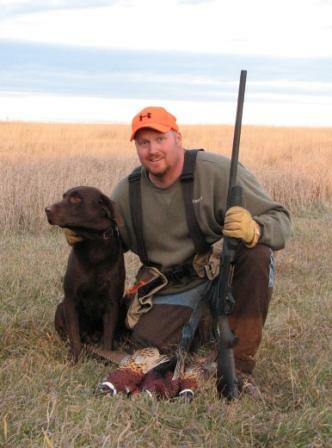 As advertised, South Dakota truly is the Pheasant Mecca of North America. I’ve got the birds and sore feet to prove it! Elk hunting this year turned out to be another great trip to add to my log. We headed up on Thursday like we have done for the previous 24 years. 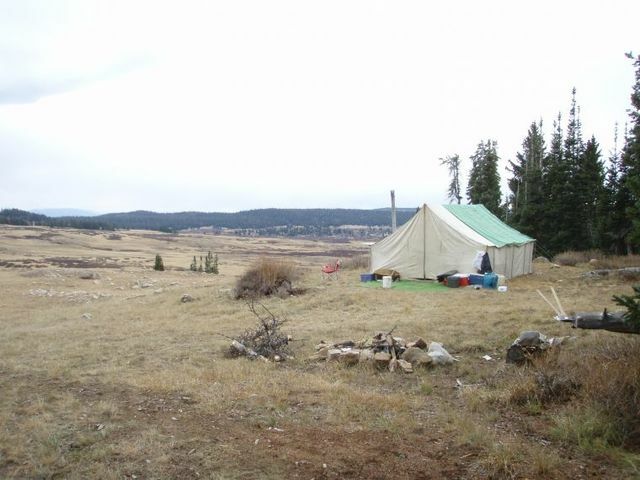 We like to get up there and get camp set up that afternoon. 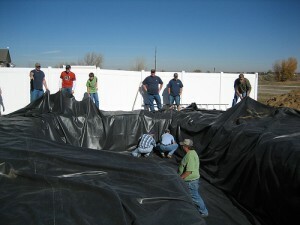 Then on Friday we just take it easy and try to get acclimated. Even though we live at 5600’ going up over 11000’ and doing physical activity can really take it out of a person. For me this was the first year that I hadn’t had my dad to hunt with. 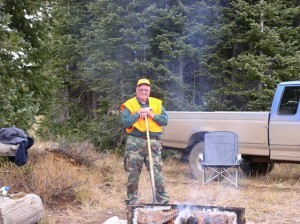 This is a picture of my dad a couple of years ago up at elk camp. I know it was tough for him to miss it this year, but I am sure that it probably kept him in my mom’s good graces! Anyway, when we got up there the weather was just absolutely gorgeous. Friday was much the same and I just basically lazed around for most of the day getting things ready for the upcoming hunt the next morning. the shot off. He never knew what hit him. He went down like a sack of bricks. My hunt was over. At least the fun part. After gutting quartering and hauling him back to camp, I skinned him out and put him on the make shift cooling racks that we have and enjoyed the rest of the gorgeous day. The next day we woke up to sideways blowing snow, so we decided to get out while the getting was good. In all we had taken two elk, a cow and a bull. Only 50% but at least we would all have a freezers full supply of meat for the year and we had a great time. When deer attack! Sort of. you get caught in a blizzard? What if you fall and hurt yourself? What if your deer attacks you? Remember that even if the animal hits the ground, it may not be dead. pictures can wait. Be careful and have a good hunting season.